On 16th & 17th of December, 2017, Bahrain based artist Thajba Najeeb conducted two short events through the Pakistan Chowk Community Centre for the artists' community. Thajba was such a delight to meet with. She surrounds herself with a positive evergy which is almost contagious. The meet & greet with her on the 16th of December was at the centre and a few of the artists from the locality participated. It was such a beautiful afternoon, where Thajba shared her work and experiences with the artists, and in turn the artists shared their own. A little weak in spoken Urdu, Thajba did not let her linguistic limitations be any factor in restricing dialogue with the participants. It was an exciting event. "Paint Your Mind" was a workshop that Thajba conducted the very next day i.e. 17th December, 2017. 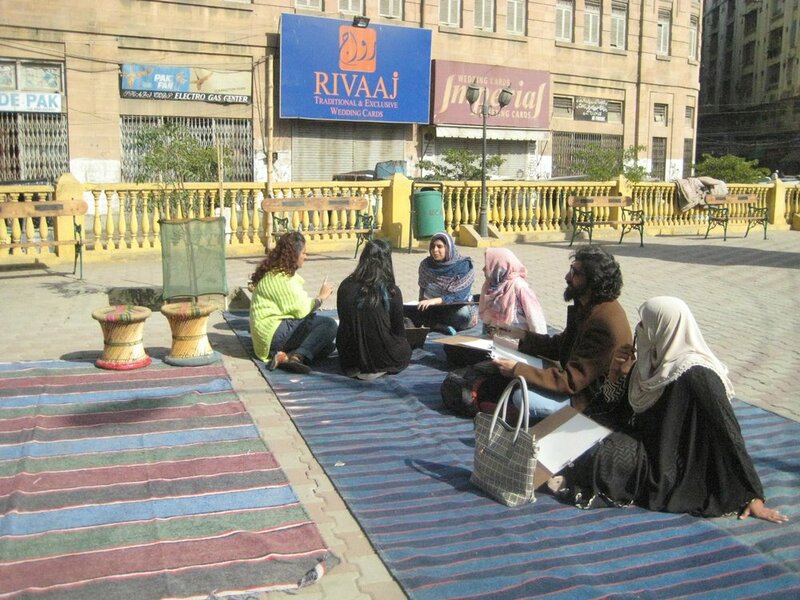 This was an outdoor workshop where participants were guided by Thajba to draw inspiration from their surroundings & draw free hand. It was an exciting evening at the Pakistan Chowk & Thajba seemed to enjoy her visit as well. "My experience.. from walking up those red stairs to sitting under the tree in the middle of the hustling bustling streets pf Pakistan Chowk... was a true and new experience for me. I love the passion students, teachers,mentors and creatives have to restoring the image of these long forgotten monuments. Personally a new challenge was to refocus all my energy whilst getting distracted and working in an uncontrolled environment. I look forward to working towards creating a festival event with onsite painting, food and chai where a beautiful half day can by spent basking in the sun, conversing, painting and creating by expression. I have many ideas of collage workshops inspired by buildings.. acrylic workshops- all student oriented... but need to plan it out...and will send proposal to you once i organise it with nadia asap. Thank you very much to you for your effort, time and energy spent towards this and for this opportunity. I look forward to having a blossoming relationship with you on this front." Thank you Thajba Najeeb for bringing to PCCC your positive aura; we hope to host you again soon! A year ago on July 15th, Qandeel Baloch (Fauzia Azeem) was killed by her brother. She was 26 years old when she was murdered. In her short life she held a mirror up to us. Our society's hypocrisies and its blatant hatred of women. She was a woman who had nothing yet fought to live her life on her own terms. Armed with a smartphone and a bold, red lip, Qandeel Baloch winked at us from our laptop screens and then laughed when we responded with venom. She refused to back down and struck back with wit, charm and infinite resilience. In celebration of Qandeel's life, Girls at Dhabas and Pakistan Chowk Community Centre invited the community to paint a mural of Qandeel on July 15, talk, share and learn while creating something together. Splashing the colors of resilience on walls near Pakistan Chowk, we refuse to forget her, the women before her, the women among us, and we will fight hate with art and solidarity. 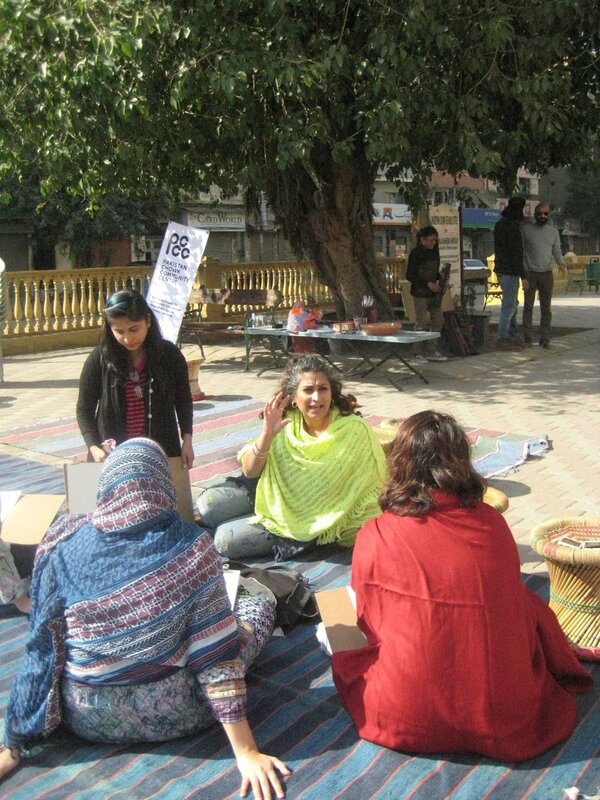 The Rang Saazi was followed by a dialogue at Pakistan Chowk Community Center the day after, discussing what happens when people get together to make controversial art in public spaces, about women who decide to live and practise their daily lives differently. On July 14 and 15, our team of interns displayed and sold the works of the oldest artists of Old Town, like Ahmed Anwer, among the works of contemporary artists at The Second Floor's Jumma Hafta Art Bazaar. It was an excellent to bring the works of the Water Color Society at Pakistan Chowk under the spotlight and talk about the process. Spoken histories of Old Town veterans were put on public display in eight postcards for people's engagement. People also got to have a glimpse of the Pakistan Chowk Community Centre on postcards, carrying our mission and our narrative further. JHAB proved to be a great way for people to learn about what Pakistan Chowk Community Centre aims to be and how they can contribute to make it happen. In 1880’s, the area was bought by Gidumai and mapped out as an educational center in the city (Khuhro, 1997). It was from here that the Sindh College Association began to operate, and it was here that Gidumai himself laid the foundations of the D.J Science College, of which he became the principal. After Gidumai died, the area was bequeathed to Kewalram Shahani, Gidumai’s son, who became the long-living educational and cultural patron of the area. Under Kewalram, however, the area transcended its mere educational activity to that of tourism, too. The Chowk housed the busiest taxi and Victoria station in the city, which was popularly known as the Purana Tonga Stand, which tourists and locals alike used to visit nearby cafes and restaurants, two of which were the popular Café Saadi, and Kaisar Restaurant. The former served as a public space where students from nearby institutions could interact during lunch breaks, and became an important hub for educational interaction, and the latter became famous for serving the likes of Noor Jehan. Just behind Café Sadi, the Chowk also housed the Bholu Akhada. A muddy wresting arena, the Akhada became the breeding grounds for wrestlers, producing great sportsmen like Bholu Pehelvan and Aslam Pehlevan, who both became world heavyweight champions. On one occasion, the president of Pakistan himself, Khwaja Nazimuddin, travelled to the Chowk in Karachi to watch the match. Pakistan Chowk’s history, thus, is a rare intermingling of education, sports, culture, and metropolitanism. However, while patronizing Pakistan Chowk as a space for tourists and culturalists, Kewalram Shahani also made sure that the activities in the area stayed true to the original spirit of his father: that of education, and perhaps, this is what the Chowk’s defining trait eventually became. The Shahani family were Hindu-Sindhis, and essentially, educationists and writers. Hence, the very pathos embedded in the family’s history made it a cultural imperative that the area be utilized as a hub for the printing press, reason why Arif Hasan calls the area perhaps “the first flourishing printing press of Karachi”. Gidumai had himself translated the likes of Jab Sahib, Bhagwat Gita, and Yoga Darshan, and these books were available in the newly flourishing literary market that founded its basis at Pakistan Chowk. Kewalram, on the other hand, became a philosopher, and wrote a treatise of Sufi philosophy called, “Mana Jo Chabuka” (The Scourges of Heart). The young man quite surprised the literati at the time when he wrote the first feminist novel of the Sindhi language, “Maa aen Dheeya” (Mother and Daughter). Keeping up to their literary progress, the Shahani family opened up libraries, translation centers, and art schools around the Chowk. The Saranagati building, the most imposing building around the Chowk, a red sandstone structure, was donated to the British Council and turned into a library, the second floor of which housed an atelier for emerging artists. One building on the corner, which has now been turned into a card printing shop, became the headquarters of the Sindh Sudhar Society, which oversaw the launching, circulation, and distribution of many quarterly publications, such as Ismat and Saraswati, which were made readily available to students living inside the area, mainly at the Meetharam and Sevakunj Hostels. This brings us to a wholly distinct and important tangent of contribution: the hostel culture for which Pakistan Chowk became a facilitator, where the students of the newly flourishing NED University found home. By this time, the rupture of Partition had occurred, and newly pouring migrants, including students, recognizing Karachi as an important educational front, began to utilize the Pakistan Chowk. Three large hostels were opened: Sevakunj, Mehtaram, and Meetharam, the latter named after Kewalram’s late younger brother. All hostels offered free services and many of their residents were alumni students pursuing jobs, who went on to live there even after graduation. The hostels also housed reading rooms, where students could read dozens of daily newspapers and periodicals. Sevakunj has a strong presence and character: it is decorated with a minimal but elegant façade. Inside, there is a small courtyard, reminiscent of a Persian sahn, in which students would accumulate in the evening and discuss education in a communal whole. The main architectural feature of the verandah is its arcading of exquisite motifs, often incorporated in buildings at the time; however, an unusual feature are gable frontages, possibly due to the influence of the recently completed Viceregal Lodge at Simla, considered to be a “free interpretation of the Elizabethan or English Renaissance.” (Davis, 1985: 117) Meethram is more intricate, the front façade comprising of detailed window-work, and a gallery. The neo-classical style of the hostel is not surprising; at the time many other native patrons and affluent philanthropists considered Renaissance and Palladian Architectural expression as the most befitting, which conveyed their enlightenment disposition and civilizational progress, which kept up with the cultural spirit of Pakistan Chowk. (Lari, 2000). Precisely who designed these hostels has fallen into historical obscurity, but Lari contends that it may very well have been Strachan, who designed other buildings in the vicinity, and that Meethram’s neo-classical accuracy could only have been devised by a mastermind such as Strachan himself (Ibid). 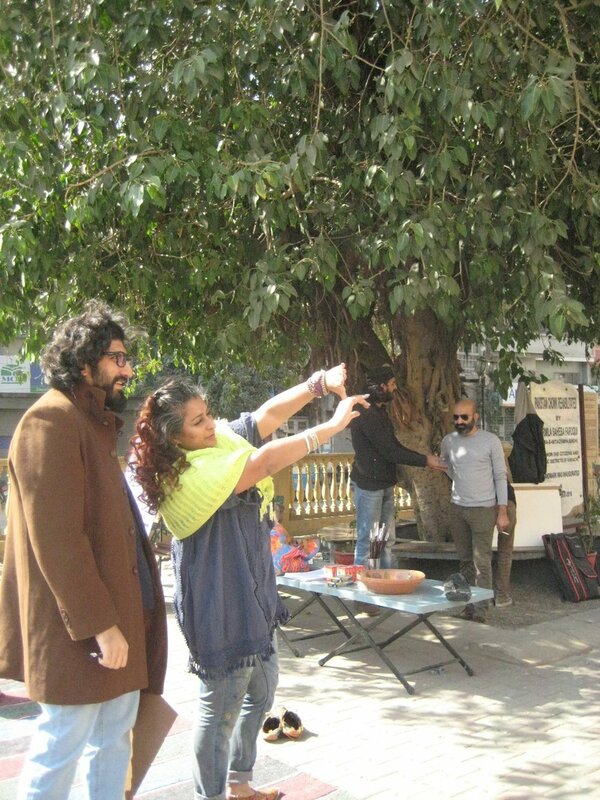 Lari and Davis both point out to an important fact: that the very architecture of the buildings surrounding the Chowk echoes its socio-cultural pathos. Architecture, then, becomes a way to sustain culture – stamp the architecture down, and the culture will go with it too. It is the broken staircase I notice first. There is practically no way to climb to the space of the chowk itself – it can be quite high for the elderly who may face difficulty reaching it. Hence, its accessibility is limited to people who are physically strong to jump. Someone like my grandmother cannot reach the Chowk. A broken balustrade/grill. It disappears halfway into the air, and does not line the complete parameter of the Chowk. A nearby shopkeeper tells me that there was an original balustrade, only obstructed by stairways on both ends of the chowk, hence giving the area a genuinely neat look, something that has been replaced by a more precarious look now. Garbage and Waste: The chowk is surrounded with trenches, waste and garbage disposal, some of which has been set to fire, and there is a cloud of gray smoke emanating from one side. It is difficult to breathe. I manage to locate the area’s oldest occupant, Arshad Abdul Latif, who runs the Pakistan Tailors in the area, which opened in 1955. Originally a migrant, Arshad has seen the spacial features of the Chowk change over the last period of 50 years. He recounts that the last appraisal of garbage waste in the area was done by municipal authorities in 1989, under Benazir Bhutto’s government. There has been none since. The Peepal Tree: There is a massive peepal tree at the center of the roundabout, which serves as a giant shade, that can be utilized in very interesting and creative ways. Right now, it serves as a shade/resting place for beggars/fakirs and people working at nearby car repair shops. Usually, men in greasy clothes are sleeping underneath the tree on an ordinary afternoon; you can notice their sacks and bags hanging from the branches of the tree; a mirror hangs loose with a broken toothbrush attached to it; these bags contain rotten food for days – some bags are torn and the food is spilled everywhere, leading to an unbearable stench – there are flies all around them, and their pillows and clothes bundled together, lined against the body of the trunk. The description is not meant to demonize these subjects along the lines of classicism; it is to show that these factors genuinely accentuate an atmosphere of decay in the area, and lend the area a generally dirty look. When I ask one fakir who lets him use this place, he tells he pays a regular sum of money to the police-man in the area. If an important part of heritage preservation is also bioecological concern, then this peepal tree must remain clean, and these people should be relocated to other spaces for their afternoon naps – the political implications of this should be considered first. Benches: Abdul Latif also recounts how in the earlier years, while there were no benches, residents of the area would bring mats and chadors with them in the evening and play ludo and taash. Evening leisure activities around the Chowk are now almost non-existent. Tonga Stand/Fountain: There is a dry fountain. This, however, was not used for drinking purposes as much, but for mere decorational ones. A prime use of the fountain, however, was for Tonga-walas. Imam Buksh, who watched his father drive a horse carriage, the ‘Victoria’ around the Chowk, and who now spends his time commuting children from school to homes, recounts an interesting story. When his father died some decades earlier, Imam Buksh inherited the family’s only horse. The horse, too, died after a few years. Imam tells: “Horses also need gallons of water, especially in this Karachi heat. The fountain water was used by all tonga-walas for their horses. Unfortunately now, it does not work. The public tap, at the Purana Tonga Stand, also gives no water”. The Purana Tonga Stand also had tethering spots where tonga-walas could chain their horses and carriage, but this spot has been erased. Many like Imam live in the fear of their horses and Victorias disappearing in the night. Last year, the government decided to convert Mitharam Hostel at Pakistan Chowk into a sub-jail. The proposal was approved by the Sindh chief minister, on the request of the Rangers DG, Major General Bilal Akbar. The latter had asked the provincial government to allocate a facility to detain suspects, especially those being interrogated by the Rangers under the 90-day preventive detention in accordance with the Anti-Terrorism Act. The CM House spokesperson noted they had sent a summary of approval to the home department. The historic hostel has already been under the use of Sindh Rangers since the last several years, serving as barracks. The Sindh government’s decision to convert the Mitharam Hostel, an historic edifice with magnificent architecture, into a sub-jail has drawn severe criticism from conservationists who demand the government to take back the decision and set up the jail outside city limits, for the hostel is among the over 1,000 buildings declared protected under the Sindh Heritage Protection Act. The prime minister announced earlier this year that the Green Line will be extended all the way to the CDB area. The project, worth Rs16 billion, is being funded by the federal government. 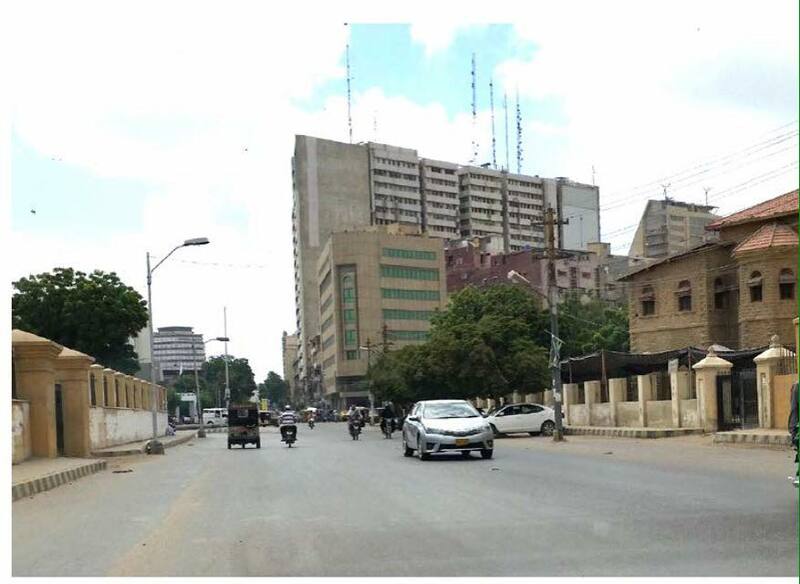 Sualeh Ahmed Faruqui, chief of Karachi Infrastructure Development Company Limited (KIDCL), responsible for the building and execution of the Green Line BRT project, is of the opinion that they have to take the project to its logical end, which is Tower. He said if they turned the Green Line back right from Urdu Bazaar, the purpose of the project would not be fulfilled. This makes it essential for a new route to be devised, says Dr Muhammad Tahir Soomro, EA consultant and former director of Karachi’s mass transit cell. The Green Line is now expected to enter the Saddar area from Kutchery Road all the way to Pakistan Chowk and then through Court Road, touching Sharah-e-Liaquat, and entering MA Jinnah Road. With this route plan, EA consultants believe the volume of passengers will increase by around 0.2 million people, which will reduce the cost of the government’s subsidy. 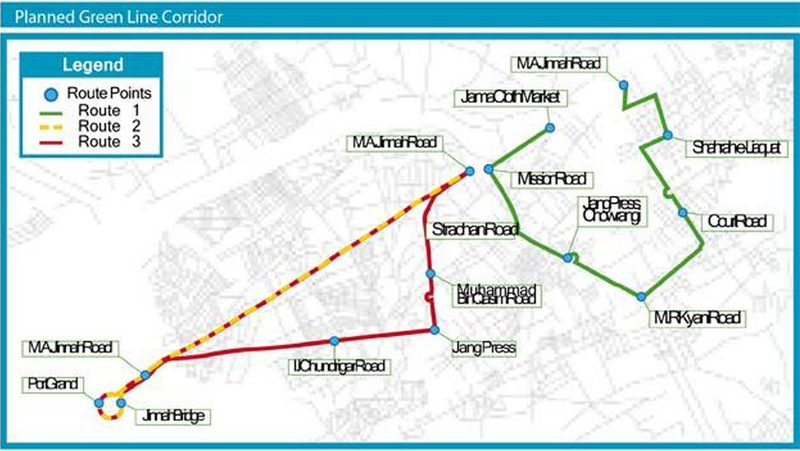 This route, however, does not sit well with Ashar Lodhi, an operational consultant for both Green and Blue lines, who argues that the Green Line would require additional bus-stop stations to be constructed across the areas it passes through, many of which are mixed-traffic areas with historical roundabouts where street-interaction is an important aspect of one’s lifestyle. To counter this, and make the project ‘city and culture friendly’, the KIDCL has invited not only urban planners on board, but also cultural theorists, academia, and civil society members, to provide their input on the plan, and devise ways in which this project does not subsume the culture of the Chowk. The marriage between cultural and civil society actors with developmental authorities, has, however, never been successful. It is only a matter of time which will reveal how this collaboration turns out, and whether, if the Green Line Metro is to cut through the Pakistan Chowk, will take into account its rich socio-cultural and historical significance.